Check out Lumberjock JLB and his fluting on a lather fixture. I am wanting to know the set up and the router bit to round over a blank 1 1/2” square to round stock approx 1 1/8” . Like routing making a dowel rod! Thanks! Mike: You are talking about a musical instrument flute, not cutting flutes onto a piece of wood, yes? 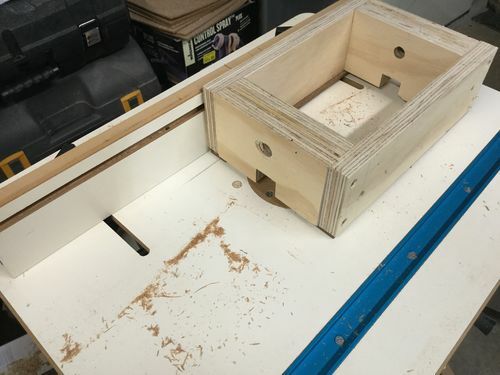 What problem are you experiencing with using a table mounted router to cut the groove? You say that you need to look really good. Do you mean that you need to see the piece better than you can using a router table? With a good fence on a router table, routing a groove down the length of a piece of square stock is a fairly simple operation. You can do the same with a hand held router, simply clamping the piece onto a bench top, but you won’t see much more of the action. I make flutes. I just need to be able to see what I am doing. This groove, somewhat of a flat spot with a groove in it could be done with knives ,gouges etc.It is only about 2” long .It would just be good to have a simple set up for this. This guy mounts a router a router in the table of the drill press and then inserts wood into the chuck of the drill. I think it is the reverse configuration of what you are talking about , but it might give you insight. I think you might also want to look at a “overhead pin routers”. Router table is the best way to cut a groove in something that narrow. You don’t really need to see what you are cutting. You simply need a way to control the starts and stop. An easy way to do that is with stop blocks. If you are cutting in from the end, you just need one stop block. If the groove doesn’t go to the end , in other words 2” long somewhere in the middle, you just need stop blocks at each end to control the total length. Set on end against one stop, with other end in the air, and lower the piece onto the spinning bit. You then slide it along the fence until you hit the other stop block. This is a different problem than cutting a 2” slot. To turn a square blank into a dowel, you can easily use a round over bit with the right radius on the router table. You will need a 9/16” roundover bit to get a 1 1/8” dowel. To start, I would cut the blank down from 1 1/2” to 1 1/8” square (cut your 2” slot first). You will need the piece to be a little longer than the final length. You then set the height on the roundover bit to cut exactly half the width of the piece. The key is start and end cutting slightly in from each end so that the ends stay square. This allows you to slide the piece at the same height across the entire length without it rolling over. EDIT: You repeat this on all 4 sides. You then cut the square ends off . Of course your router table needs to be long enough so that neither end is ever off the table. Practice the cut on a piece of scrap to get the height of the bit setup perfectly. When it is right, there will be no ridges. Let me know if that doesn’t make sense and I will send s picture. Makes sense.I see now.Leaving the very end square make a lot of sense.How do figure what size of router bit to use to get what size you are wanting in the finished size? This 1 1/8” dowel really is a tube.I turn them right now on a lathe but some have said it is easier to do with a router.Sometimes flute makers wont give up but so much of their secrets lol Thanks!! Mike: I would respectfully submit that turning the square stock into a round “dowel” is not easier using a router than doing it on the lathe. The lathe is made for making things round. The lathe is indeed easy to make something round.I have done it a long time.BUT I know guys that use the router set up and they swear by it. I havent done it but I can envision with the right bit with just a few passes the tube would need only a little sanding.With the lathe there is going to be some sanding….harder to get it smooth and even everyday…all the time…Even with the right lathe tool work …somedays your tool might not be as sharp as it need to be,or you may be off on your tool work on the lathe..I make flutes.,bowls,hollow forms so lot of hrs on the lathe…The router could be just easily more consistent once I understand the setup…..This isnt argument but just think the repetitiveness would be easier on the router….once I get the set up..I think I see it now… Hope this makes sense.. The roundover bit size is the radius of the arc so to determine the size of the roundover bit , you simple divide the diameter you want in half 1-1/8=9/8 so 9/16” radius. The router table method is super easy and once you get the height of the bit set accurately, you can cut them very quickly—4 passes. It is very repeatable. I’ve done this on lathe as well and to get precision takes more work if uniformity is important. I was wondering if you had a method for boring out the center. Here is what I would try, also using a router table. Rip your 32” piece in half, before cutting to 1-1/8 size or start with 2 pieces. Then you need a cove bit that matches the size you want the bore to be. I would think that you need at least 1/8” walls which means you need—7/8” bit at most. 3/4 would give you an extra 1/16th of an inch wall thickness. Mount the bit on the router and set the fence so that bit will be centered on your piece as you slide it along the fence. I would start by making light passes and raise the bit until you reach the full height (=radius of the bore) You will then glue the 2 halves back together. I would use a dowel coated with wax or packing tape that is the same diameter as the bore to make sure they align perfectly. Once clamped, pull out the dowel before the glue sets. You may want to sand the dowel so that it slides out more easily. Once the glue has set, I would but a dowel back through the bore to reinforce and support the thin wall while routing the outside diameter. When you cut the glued up square tube to the final 1-1/8” square make sure you keep the bore centered. You may have to shave some off each side to keep the bore centered. Nathan,That is exactly how I started making my flutes.A lot are made that way.Now I use a gundril and a solid piece of wood and drill the bore out.It is a homemade setup but it works great.A couple of other makers helped me with that with pics etc. Thanks a bunch I cant wait to try the router on this.Yes it would definitely be very repeatable and fast!!!! I guess if I wanted just a slight taper I would just have one end be a little thicker? Wow when somebody explains something its like a light has been turned on!!!! I’ve never tried a taper with this method. if you make one end wider than 1-1/8”, I think that the problem is that it won’t be round at that end. There is another method that I have used to make a larger cylinder that is easier to use to make it tapered but I am not sure how well it will work with a long narrow dowel,especially one this long. 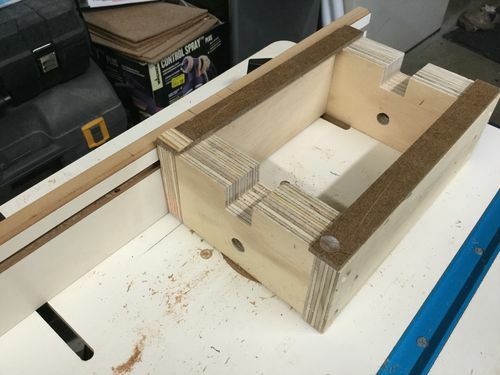 You use a box bit on the router table and mount the blank in a jig that allows you to slide the blank over the bit while rotating the blank. To make it tapered, you shim one end. I’ve attached a picture of the jig I used to make a drive roller for my shop built stationary belt sander. Yours would need to be long enough to hold the 30” blank. The second picture shows the underside where you can see one of the shims I hot glued on to make it tapered. It might be easier to do the tapering by hand after using the roundover bit method. Yeah Im sure you are right…I am good with just the round over you got me straight on!! Thanks a bunch!!!! Let us know how it goes. I would like to see some of the flutes you make. Here is my simple website.